Though Young strives to maintain a journalistic detachment from his subject, it'd be false to pretend that the film completely avoids romanticizing Roberto's journey. Instead, Young surreptitiously keeps the camera close to Roberto, a tabula rasa on whom the viewer is often tempted to project his own feelings about whatever circumstance the young emigre faces. Building Roberto's odyssey in an episodic fashion, Young is able to cover everything from Roberto's risky modes of travel to his struggles combating loneliness because of his inability to make himself understood. Representative of this particular pitfall is Sharon (Linda Gillin), an American waitress he moves in with. Far from home and friendless, it is natural that Roberto falls for the cute, young single mom. But their inability to communicate with each other causes at least one embarrassing incident, when Sharon realizes the money order Roberto is sending back to Mexico is addressed to his wife. Roberto didn't lie to Sharon about being married. In fact, he told her when they first met... in Spanish. But it's only when Sharon utilizes an interpreter to help Roberto fill out the money order that she learns the truth. 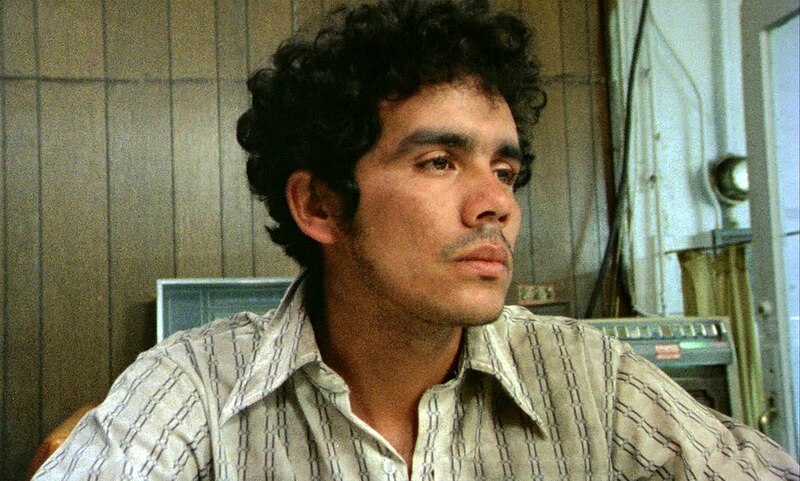 As for Roberto, the guilt of his indiscretion is underscored later when, in a poignant, unexpected way, he quite accidentally runs across the father who left him and started a second family in the U.S. Though most if not all of the cast are actors, Young keeps the familiar faces to a minimum. In truth, other than Ned Beatty (Deliverance) and Julius Harris (Live and Let Die), some others one may recognize—like Jerry Hardin (The X-Files) or Edward James Olmos (Miami Vice)—were not well known at the the time. ¡Alambrista! is also notable for being the start of a lifelong collaboration between Young and Olmos. Young would go on to produce one of the actor's best known cult films (American Me) and direct him in a number of film and TV projects, including five episodes (primarily its, arguably, best episode) of the brilliant sci-fi series, Battlestar Galactica. Another fruitful actor-director collaboration among the least discussed is that of Burt Lancaster and Luchino Visconti. For the aristocratic Italian director, the American actor served as an unlikely alter ego in their two films together. In Conversation Piece (Gruppo di famiglia in un interno), Lancaster plays a Professor who must contend with new tenants who have virtually hijacked the floor above him, a shrill family whose matriarch (Silvana Mangano) conducts an open affair with the pretty Konrad (Helmut Berger), a now penniless scion of a once prominent family. 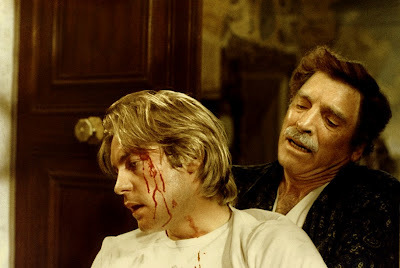 Visconti's real-life preoccupations—the tension between his noble heritage and his socialist politics, his homosexuality, his mortality—all seem to converge in the persona of the Professor and the strange identification/sympathy/paternity/ardor he feels for Konrad. It's the type of role Lancaster would rarely get the chance to play for anyone else, and he makes the most of it. What was explicit in Visconti's first venture with Lancaster, 1963's The Leopard (Il gattopardo), plays as subtext for most of Conversation Piece, upgraded to Blu-ray after its recent DVD release by label RaroVideo. It isn't until the final act of Conversation Piece that one is fully aware that Lancaster is again playing an old world nobleman lost in a society in which commoners are now rising in the hierarchical class system of post-war Italy. While The Leopard takes place during the Risorgimento, Lancaster's Professor in Conversation Piece is haunted by memories of separation from his mother (Dominique Sanda) and, later, his wife (Claudia Cardinale) as a result of the societal changes spurred by the end of Fascism in Italy after World War II. As if Cardinale's and Lancaster's casting aren't sufficient, a cameo by Romolo Valli completes the trinity of indicators that Conversation Piece is indeed a sequel of sorts to The Leopard.